Fish Ube Jam ~ I Can Do That! 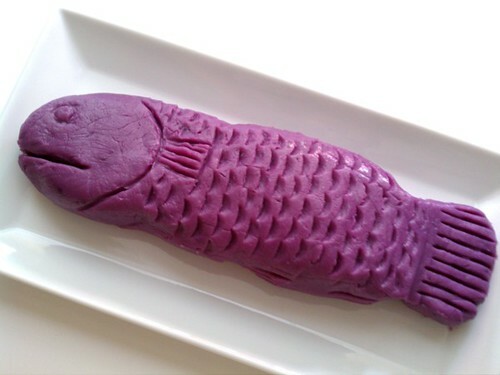 You must be wondering why the sweet haleyang ube (purple yam jam) is shaped like a fish. As a small child I used to wonder too as to why this favorite dessert is shaped as such but only during our town's annual festival celebration in honor of its patron saint. The haleya could have been shaped into a large gumamela or kalachuchi but no, year after year I saw a fish haleyang ube not just in our house but the neighbors' too. I'm guessing it has a religious meaning, that is, it's the symbol of Jesus Christ. Elizabeth Ann and Dudut have challenged the Kulinarya Cooking Club members to prepare a dish we had during the town festival, a dish worth remembering, either cooked by our Moms, relatives, friends, or domestic helpers. I don't remember much which food was truly outstanding in its deliciousness because back then I didn't pay much attention to food nor to eating. But the unusual shape of the ube jam remained and I thought of it right away when I read annual fiesta as the theme. I don't have a fish mold [who does anyway?] and used whatever I have in the kitchen drawers to add scales and details. Sorry, it doesn't look very good but it's yummy. In a non-stick wok, heat the grated yam and water and bring to a simmer. Cook over medium-low heat, stirring constantly for 10 minutes. Add both milk and sugar and cook over low heat while constantly stirring, until thick and smooth, about 40 minutes. Turn heat off and stir in butter. Let cool completely before transferring into jars. Refrigerate until ready to use. Kulinarya was started by a group of Filipino foodies living in Sydney who are passionate about the Filipino culture and its colorful cuisine. Each month we will showcase a new dish along with their family recipes. By sharing these recipes, we hope you find the same passion and love for Filipino Food as we do. That is beautiful... you have a knack for art! Reminds me of NZ's chocolate fish. This is a good idea to get my boy to taste it. And thanks for the recipe... haven't tried cooking ube haleya before. so cute!!! !Why don't we ever shape our Ube jams like that? Oh this fish is so cute. What a great story and thanks for sharing it with us. Your ube jam recipe is so good, I must try yours. Wish you lived closer, and I'd just come and buy a jar from you! Thanks for joining the KCC May event! wow! this one is so pretty :) Impressive! Trip down memory lane. I've been to many fiestas with fish ube jams, too.